It can start as a twinge or a heated pull in your lower back. Muscle knots are certainly no laughing matter when it comes to the discomfort and pain that can leave you breathless. Knots in lower back areas can happen suddenly while you’re performing daily activities or even while you are lounging in your favorite chair. Whether you have one tender, tightened knot or several muscle knots in the back, there are at-home treatments you can try to relieve your pain on the spot. Let’s discuss the finer points of these knots: what are they and what causes them? What Causes Muscle Knots in Lower Back? Referred to as myofascial trigger points by medical professionals, muscle knots are the result of miscommunication between the nerves, causing the muscle to spasm and tighten into a ball-like form. The muscle cannot relax and becomes inflamed. The intensity of the resulting pain depends on the amount of muscle fibers entangled. Upon examination, you will feel a small hard bump. The knotting of the muscle can present as a latent muscle knot or an active trigger knot. With a latent knot, there is little to no pain when you are at rest, whereas an active trigger knot offers constant pain that often radiates to other areas. Chronic musculoskeletal disorders, such as muscle knots, affect more than 10% of Americans as noted in a study published in the American Family Physician journal. Many studies suggest muscle knots are created by stationary activity such as sitting for long time periods and the buildup of lactic acid from constant constricting of muscles. The latter can occur after remaining in unnatural position for a long-time period as leaning on a desk. The body’s response to internal or external stimuli can produce these trigger points. A sudden disturbance such as a quick, violent movement, is referred to as acute trauma. Chronic microtrauma may occur when you experience continuous poor movement such as unnatural posture or constant acute trauma. Not stretching before and after exercise or practicing poor posture while sitting and standing puts you at a high risk for muscle knots in lower back. These activities can put tremendous stress on the muscle, causing them to stretch beyond their limits. If you participate in weight training or other physical activity where your muscles tend to contract for long periods of time, you may experience problems with muscle knots. A sudden injury or damage to the muscle can present muscle knots in the lower back. This may occur from an accident, a hard fall, or other trauma to the joints and tissue. You may want to avoid any movement or even the slightest touch to the affected area with the discomfort or pain from a muscle knot. In reality, the best treatment is placing pressure or heat directly to the knot. We have listed a few treatments that may help relieve your condition quickly. 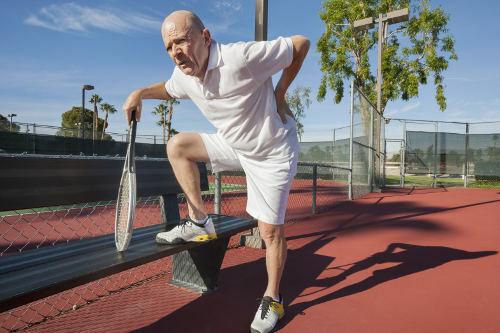 To apply sufficient pressure to a muscle knot, you can easily use any small round sports ball such as tennis balls, golf balls, or even a baseball. Place the ball, or balls depending on size of affected area, under the back as you lie on the floor. Push against the ball for 30 to 45 seconds at a time. Repeat this until you begin to feel relief. You may want to secure two balls together if you have muscle knots in the lower back on both sides of spine. If getting on the floor is not an option for you, you can do the same motion with the ball placed between your lower back and a wall. From this position, you can move up and down and side to side by rolling the ball with your back. Foam rollers can also be handy for such an exercise as they can cover a larger affected area. Just as we use warm or heated compresses to ease stomach cramps and headaches, we can also use heat for muscle knots. Any warmth to tissues and muscle fibers can aid in relaxation and the prevention of further constriction. This may alleviate pain as well. Options include a hot bath, warming oil, a heating pad or hot water bottle, or even a hot stone massage. If you are lucky to have this latter form of treatment, you may enjoy results similar to acupressure and reduce stress at the same time. Stress and anxiety have also been linked to the development of muscle knots. A regular massage can also give you relief from pain and discomfort of muscle knots in lower back. A deep muscle massage promotes better blood circulation to the tissue, which can relax entangled muscle fibers and remove knots. Massaging an area on the body may also contribute to the release of anxiety and stress. Studies show dehydration can greatly affect the function and mobility of our muscles, joints, tendons, and supporting tissue. Ensure you drink plenty of water throughout the day and evening to aid in the release of tight knots and prevent reoccurring muscle knots. Muscle knots in lower back areas can cause great discomfort and pain and disrupt your daily activities if left untreated. From distress on muscle fibers to sudden injuries, muscle knots can be the result of various health conditions and lifestyle factors. Presenting as tender but hard small bumps, muscle knots reflect the constriction of fibers bunching together. There are natural remedies for you to try with no harsh chemicals or side effects. As muscle knots can occur at any time, these treatments are ideal for relieving pain and discomfort wherever you are. “Muscle Knots in Back,” Med-Health; http://www.med-health.net/Knots-In-Back.html, last accessed March 3, 2017. Saglimbene, L., “Muscle Knots in the Back That Are Big & Hard to Get Out,” Livestrong, August 16, 2013; http://www.livestrong.com/article/429676-muscle-knots-in-the-back-that-are-big-hard-to-get-out/, last accessed March 3, 2017. “Low Back Pain Caused By Muscle Knots,” Flexible Athlete; https://www.flexibleathlete.com/low-back-pain-caused-by-muscle-knot, last accessed March 3, 2017. Edwards, T., “Muscle Knots: What They Are and How To Treat and Defeat Them,” UDEMY, May 19, 2014; https://blog.udemy.com/muscle-knots/, last accessed March 3, 2017.